Nelson Water Gardens Disappearing Fountain Reservoirs are designed and manufactured in the U.S.A! Square reservoirs hold 27% more water and have 27% more surface area than circular reservoirs, thus giving you more volume. 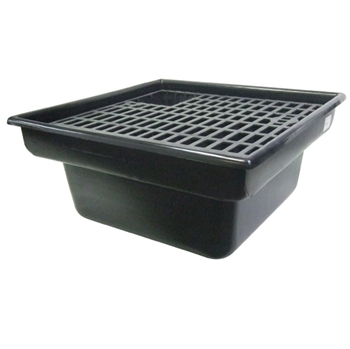 Square reservoirs have a larger splash zone and offer greater flexibility. This means you have to refill them less often, and are less likely to burn up the pump. Our material is not brittle and is not subject to sun damage which leads to cracking. Nelson Water Gardens Reservoirs WILL NOT crack due to age! Nelson Water Gardens grating is TOUGH!!! When supported properly from below, we've set a 1,450 lb. piece of petrified wood (diameter at base is 20") on our grating inside a 4' x 4' basin. Cinder Blocks should be used for proper support.